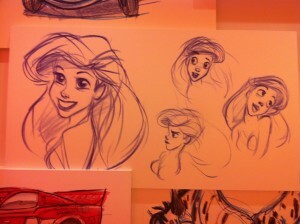 Art of Animation- A Review! 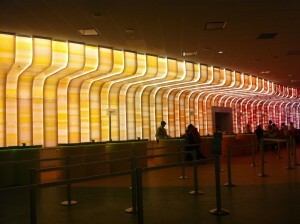 On a recent trip to Walt Disney World I had selected to stay at All Star Music on a passholder rate. 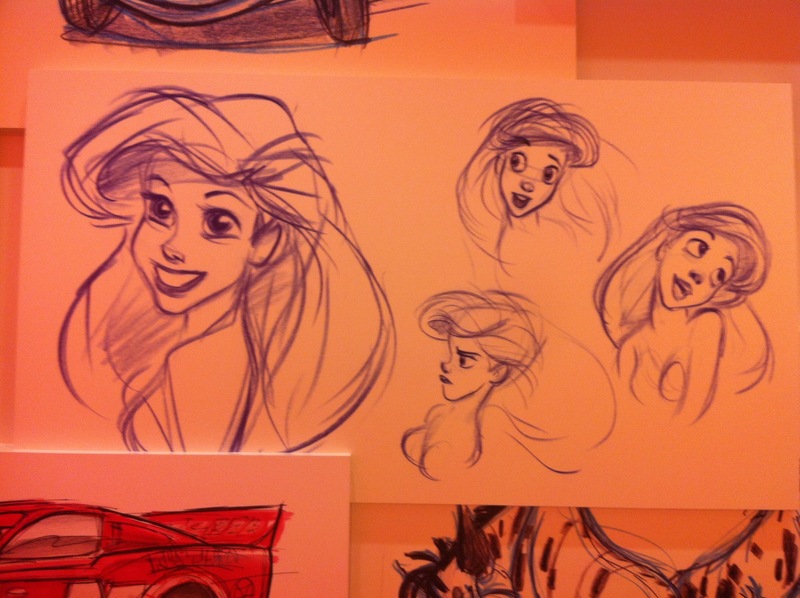 A few days before I was set to leave for Orlando I had an idea, why not see if I could get into a Little Mermaid room at Art of Animation. This is Disney’s newest value resort having just opened in 2012 and I was excited to check it out. I made the switch and with my annual pass the room only cost me $16 a night more than All Star Music, which is a pretty good deal. I arrived at AoA and was immediately in love. The resort is really pretty. Of course it is bright, colorful, and the larger than life icons that we have all come to know at the value resorts were all over the place. 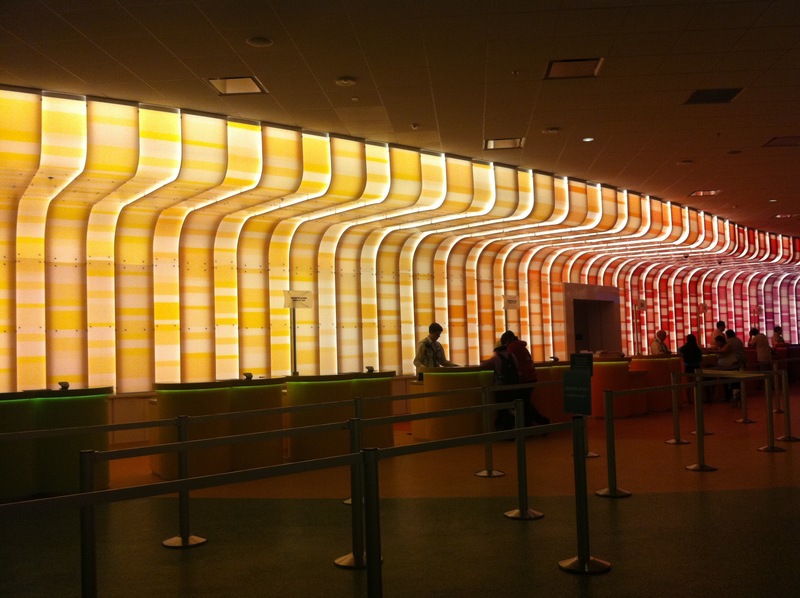 When you enter the lobby it is like you are entering a giant animation studio. 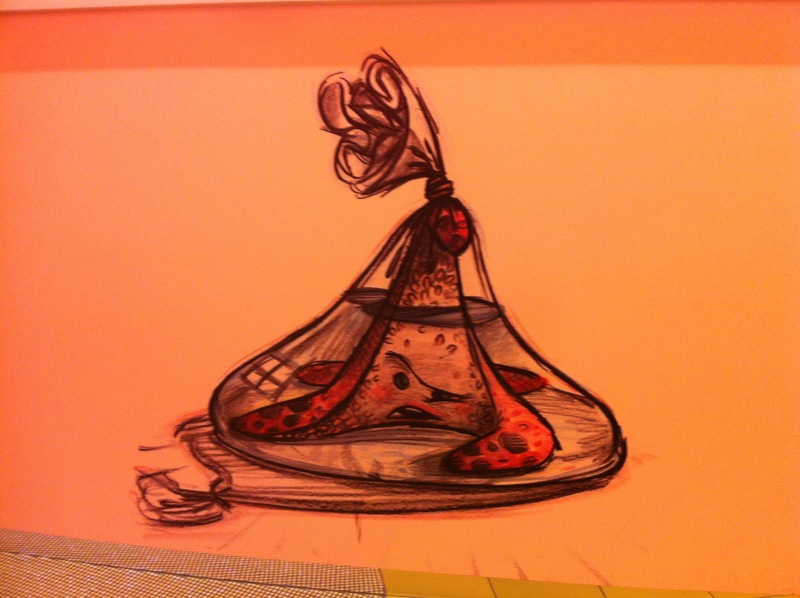 The pictures on the walls take you from the sketch and brain storming phase to the final drafts of the four featured films of the resort; Little Mermaid, Cars, Finding Nemo, and The Lion King. When the wall of animation ends you are led to the next step in the animation process which is the Ink and Paint Shop. The resort tells the tale of bringing an animated feature to fruition perfectly! I was lucky that there were no lines upon check in and was treated to excellent service by a attentive cast member. What is really amazing about check in is that the cast members can come out from behind the podiums and personally greet you! This is not the case at many other resorts where the cast members are behind one long desk eliminating this interaction as an option. I was so excited to get to my room, I really didn’t pay attention to the gentleman as he gave me directions to my building. I knew I had reserved a standard Little Mermaid room and saw the section when I arrived. Why it didn’t click that he was telling me to stay on Route 66 and when I saw Tow Mater I would be at my building is beyond me! I drove to the Little Mermaid section, got out and could not find my building. I finally decided to consult a map and realized that I had been upgraded to a cars suite! 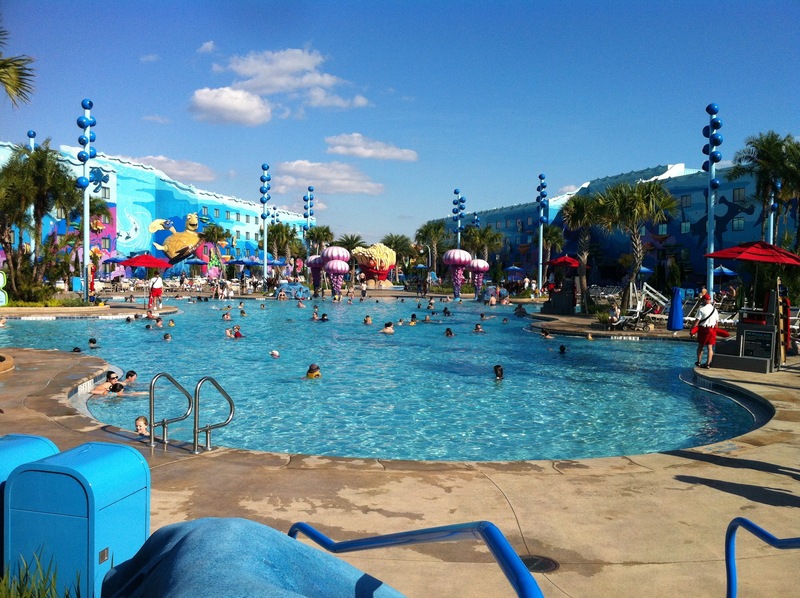 The cars section of the resort is located near Animation Hall and The Cozy Cone Pool and is very easily accessible from the Big Blue Pool which is the feature pool of the resort. The pools are all locked and only guests can open the gates via their room keys. This is a nice feature because I think these pools would otherwise become crowded with guests from nearby Pop Century. One thing I really liked about the Big Blue Pool is that there is a Refillable Mug soft drink station at the Drop Off Bar located in this pool area. This makes it easy for guests who are lounging by the pool to refill on soda and iced tea without having to dry off and go into the food court! Since Art of Animation is a value resort you will not find hot tubs, slides or towels at the pool areas. Plan on bringing towels from your room. They will replenish them. This is good to keep in mind when packing up to head to the pool. I was there during a very quiet time so the pools did not seem very crowded. In fact, the Cozy Cone Pool in the Cars area was almost always empty and this was really great because getting a prime spot inside one of the large orange cones that serve as pool cabanas was no problem! The room was in a word…awesome! The attention to detail was so cool. The room was bright which to me was a huge plus over the over values that I feel lack light since they only have one window that is often shaded from the balcony above it. The room has 3 full size beds. One is in the bedroom, one is a pull out from the sofa, and one is a Murphy style bed that pulls down from the wall and rests upon the kitchen table. 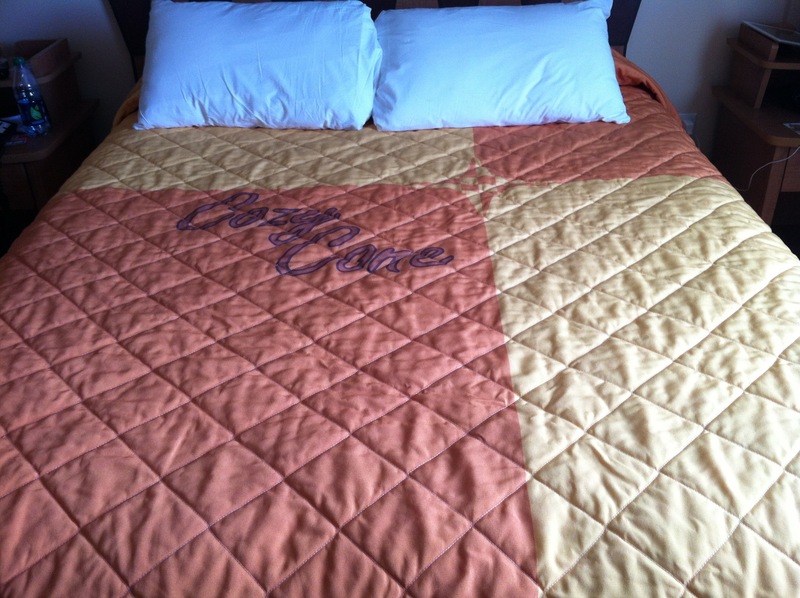 I slept well and would consider the beds comfortable, though I am sure if I was sharing the bed with my spouse it would have been a bit cramped. 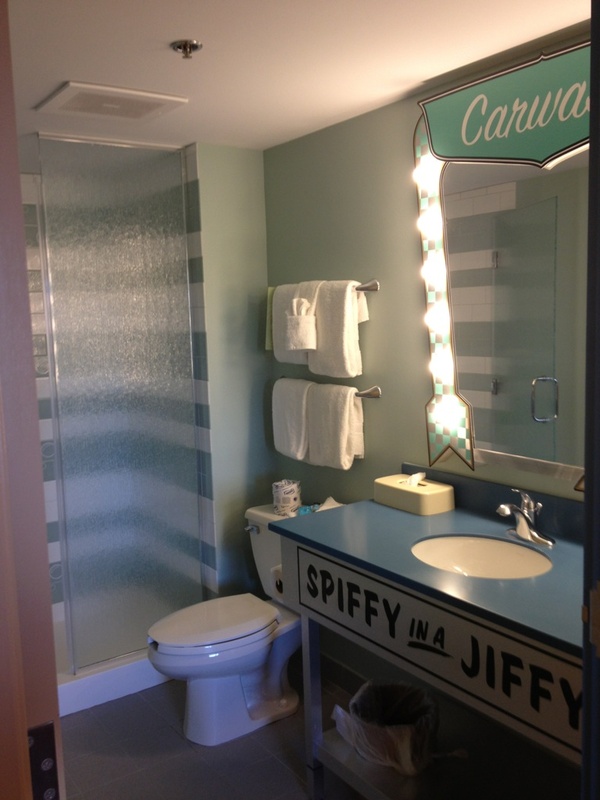 There are two bathrooms; one with a stand up shower and one with a bathtub. Both were decorated as if you were in a car wash! I also loved the drawers and kitchen area which looked like tool boxes in a garage…very creative! 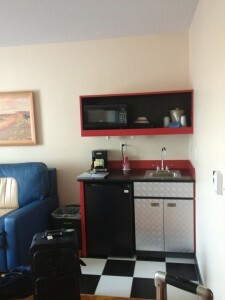 The kitchenette had a fridge, microwave, sink, and coffee maker and was stocked with paper plates, bowls, cups, and cutlery which all came in very handy. The convertible sofa looked like the back seat of a vintage car and I thought this was a great touch! Another thing that I really liked, and this may seem silly, but the water pressure in the showers was spectacular! You don’t get that at all of the resorts! The WiFi worked very well which was also pleasing as this had not been my experience at a recent stay at The Beach Club. However, my cell phone did not work in the room even when near a window. I had to go out into the hallway to get any reception. The food court, Landscape of Flavors, is by far the best dining option you will find at a value resort. Each station features some sort of make your own option such as customizing a burger with different types of cheeses, sauces, and toppings, design your own pasta, custom smoothies, and cereals along with standard menu items. They also feature many healthy options. 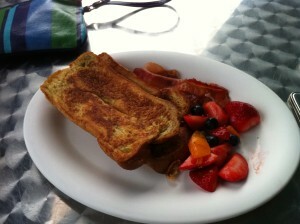 I really enjoyed my french toast for breakfast and burger at dinner time. Everything was prepared fresh and it was very tasty! I had a rental car so only used the bus a few times. Certainly having the covered stops is a really nice addition that you will not find at the other value resorts. The bus service itself is a bit annoying and I can see it being down right frustrating during a busy time of year. I waited on a Magic Kingdom bus for 25 minutes, which is typical, but when the bus arrived and everyone boarded it was standing room only. I can imagine it were busier some people would be waiting for the next bus. I can also assume that waiting for a bus back to the resort on a busy night can be a bit tiresome. This is one area where I feel Disney could improve just bit. 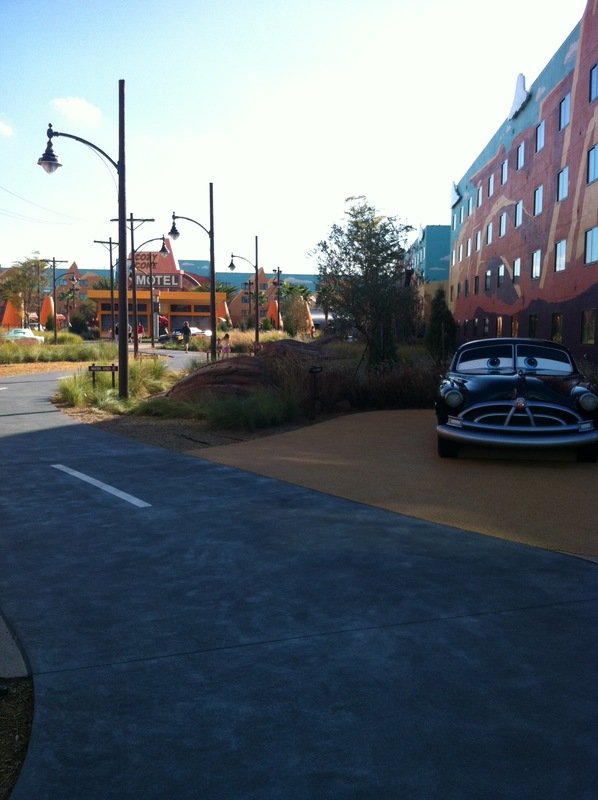 If you are looking to book a value resort for your next stay I highly recommend Art of Animation. 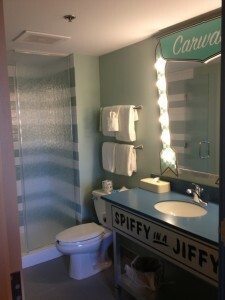 The Little Mermaid section has standard 4 guest rooms and is a bit further away from Animation Hall, but for a larger family or even a couple who wants the benefit of more room the suites are really the way to go! Overall I think this resort is a wonderful addition and a great choice! 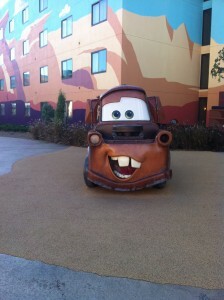 This entry was posted in Resort Info, Resort Spotlight, Review, Value Resorts and tagged All Star Music, Art of Animation, Ink and Paint Shop, Landscape of Flavors. Bookmark the permalink.